I love Halloween, but it just seems to be here so quick that I don't have time to do as much as I'd like to create some fun Halloween themed projects. With Thanksgiving in October here in Canada it just seems like the month flies! So this year I wanted to make the time to make a fun banner. With a 6 and almost 2 year old at home right now we don't do super spooky, and really I'm more of a fun spooky than scary spooky person. I used the Art Philosophy Cricut Cartridge for the scalloped banner and pennant banner shapes and George and Basic Shapes Cartridge for the letters and letter outlines. Here's a shot of the mantel decorations this year. The subway art in the frame was a free download from How To Nest For Less, which I printed on photo paper! I used Imaginisce stamps, stamped on watercolour paper with Tombow markers, a sparkly Gelliroll pen and some paper piecing with patterned paper for the vampire, mummy and Frankenstein girl. Lots of layering with paper flowers, buttons and bakers twine. Some rubons and Distress Inked edges. More ribbon tied at the ends. More info on the cards can be seen on this post here and here. Hope you are all gearing up to have a very Happy Halloween! One of the girls from the local scrapbook store that recently closed is holding Make 'n Take classes in her home. This week she showed us how to make this wonderful card! We used Perfect Pearls to create shimmering bats and cut out a circle from the front of the card base to show the spooky witch on the inside of the card. We heat embossed Happy Halloween with white embossing powder and attached a spider web ribbon to the front. The inside of the card was sponged with Distress Inks before stamping on the witch silhouette and sentiment. My local scrapbook store recently closed - so sad! However, some of the girls are doing some fabulous classes from their homes (see their Facebook page here), and the weekly Make 'n Take is short enough that I can take my little one along and make it home for nap time. Last week the fabulous Holly showed us how to create a very cute folded witch card featuring Kraft cardstock and some fun papers. The witch silhouette was fussy cut and mounted on the front of the card and the spider web stamp was placed on the right side, allowing the clear band, with the plastic spider attached, to look as if he was climbing up! We used the Corner Chomper for the orange patterned paper and placed gems in the corners. Without the band, the card opens up a bit and stands on its own. Side view - love these colours! We had a gorgeous day here in Calgary, Alberta today! And, as anyone knows who lives here, you better enjoy those last few beautiful days before the snow flies! As a Nova Scotia girl who moved here in 2004 I'm still always surprised how quick fall is here. The leaves have turned (we've already had a few snowflakes) and many trees are already bare from quite a few blustery days. So, not wanting to forget about summer quite yet I found some summertime pics to scrapbook for the October Sketchy Challenge at Canadian Scrapbooker Magazine. 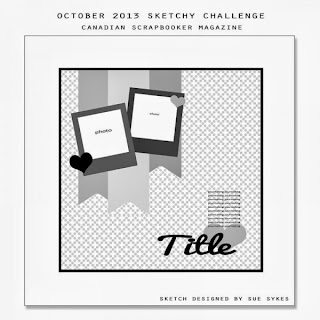 I love the look of the Polaroid picture frame, so this was a fun sketch to do. I even made a second page with coordinating colours to complete a two-page layout. I sprayed some leftover packaging with pink and orange Dylusions Inks and then used a stencil and sponged on Distress Ink in Black Soot through the arrow stencils to create the banners in the background. Of course, I had to add some Distress Inks in blue around the edges! I added some stencilled arrows along my journaling card and added in some chipboard arrows on my page. I used some of the same misted cardstock packaging on my second page to tie it together along with some arrows and orange colour. Thanks for stopping by! 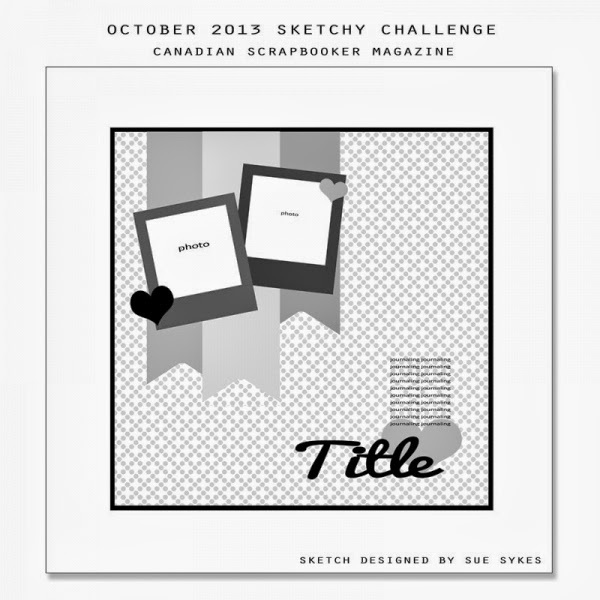 Head over to the Canadian Scrapbooker sketchy challenge to check out all the amazing inspiration! Ok, I know Christmas is two months away - but I'm starting to feel that Christmas spirit :) It always feels like December goes sooo fast, so I want to be able to take time to enjoy making some fun Christmas cards before I feel too rushed! I used black Memento Ink to stamp this cute little snowman from Sunshine Designs and then coloured him in with Prismacolor Markers. I love how the soft greens and pinks look together! Another great technique by Tim Holtz in his Creative Chemistry 2 class - Stamping through stencils! Easy Peasy, but looks very detailed. Jennifer McGuire created a beautiful Christmas card as inspiration - I think those stencils will be on my wish list! I am just blown away at the amazing amount of information so far in Tim Holtz's Creative Chemistry 2 online class. For the Stencil Sketching technique, I used markers to colour through stencils, over top of a Distress Stain background. Over top I added some Distress Inks through stencils and around the edges, some stamping and even some Distress Paint stencilled hearts. It is so neat to see all the layers come together - I could totally keep going....but off to my next technique! In this cool technique by Tim Holtz in his Creative Chemistry 2 class at Online Card Classes, Tim shows how to create an embossed resist through a stencil. I love it! I inked through the stencil with Distress Ink, then embossed with clear embossing, then sponged over with Vintage Photo Distress Ink, which highlights the cracks. Then I sponged all over with Distress Inks - what a neat effect and awesome background this creates! For my card I used the stencil embossing technique as above and then used the snowman blueprint stamp, which I coloured in, and the snowflake blueprint stamp over top of the background. I misted with water to soften the snowflakes, before I coloured in my snowman. I Distress Stained my ribbon and tied it to the front of the card. I'm entering this card over at Simon Says Wednesday Challenge blog, where the challenge this week is to use a rubber or clear stamp! Oh my goodness! Tim Holtz is soooo creative and inspiring! Day 2 in his Creative Chemistry 2 class is all about stencils - which I love, but often am just not sure where to begin with. However, this is totally my new favorite technique for sure. This tag looks so detailed and intricate, but really you start with Distress Paints, layered through a stencil, which create a resist to your Inks applied after, and you just build your layers of Inks and water spritzing and even some mists through a stencil. The original layer was the small blue circles on the right side of the tag and the yellow arrows on the left side, both done with Distress Paints. I'm entering this tag at the Simon Says Wednesday Challenge blog - this week's challenge is to use rubber or clear stamps. I'm still not done all the amazing techniques Tim Holtz featured in Day 1 of his Creative Chemistry 2 class at Online Card Classes! I didn't quite have all the right supplies for this technique, but it was fun experimenting, and that's what it's all about, right! For my tag I embossed a piece of gold foil cardstock and, not having black Distress Paint on hand, I improvised and rubbed on a few other colours of paint. However, I didn't really get the results I was looking for so I used some black Crackle Paint. I think I left it on a little too long so it didn't rub off as much as I was trying for, but it still has a cool effect. For my card, I used the same gold foil cardstock and embossed with a Tim Holtz Sizzix embossing folder. I then used the black Crackle Paint, mixed with water, over the image to highlight the grooves. I sponged Distress Ink on cardstock for a background and applied a Graphic 45 ruler stamp and a Tim Holtz sentiment stamp, which I clear embossed over to give a darker image. I used Tim Holtz's Resist Paper Stash and an arrow stamp, which I embossed and cut out and popped up with foam dots and a chipboard circle I sponged with Distress Ink, stamped and clear heat embossed. I'm entering my card over at Simon Says Wednesday Challenge blog, where the challenge this week is to use a clear or rubber stamp on your project! Here is another fun and addictive technique by Tim Holtz - Distress Paint Crackle, in his Creative Chemistry Class 2 at Online Card Classes. For my tag I cut out leaves from the Art Philosophy Cricut cartridge and covered them with Distress Rock Candy Crackle. After they dried I sponged on Distress Paints and then went over with some Distress Stain and Inks to highlight the crackles. So cool! For my card I used the same technique to cover all my chipboard pieces and then I punched a hole in the flower and heart to hang the jump rings and attach the heart, which hangs freely. I layered chipboard pieces, paper flowers and a gem to complete the flower - I just love the look of the crackle! 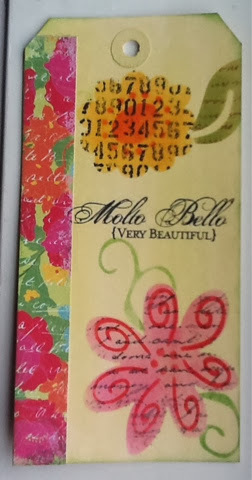 I used the Tim Holtz ChitChat stickers, stained with Distress Stains to create a sentiment. I used the Tim Holtz Resist Paper Stash, covered with Distress Stains, for the inside of my frame. 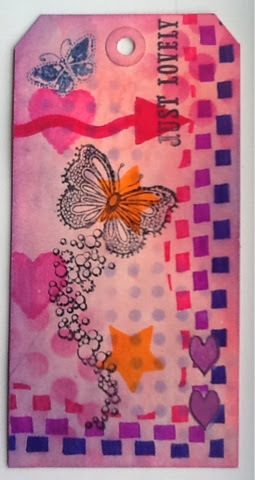 I coloured the butterfly with Tombow Markers and Rock Candy Glitter. Hope you head over to Online Card Classes for more inspiration from Tim! I am soooo excited to start Tim Holtz' class - Creative Chemistry 2 at Online Card Classes! There were 6 techniques shared just for Day 1! In the first technique video Tim showed how to marble Distress Paints. It gives such a cool effect! Then, we were inspired by Shari Carroll, as a guest designer, featuring this marbling technique. I made a tag showing the technique and then 2 more tags using this technique. So fun! I applied the paints on my craft mat to create the marbling effect. Then I sponged over the tag with Distress Inks to give it more depth. Just love how this looks! I made two tags inspired by Shari Carroll's tag. She is just so talented! I cut petals off of a larger flower and trimmed them with zigzag edged scissors for leaves.